» Let’s show our support for moms—not just on Mother’s Day, but every day! Let’s show our support for moms—not just on Mother’s Day, but every day! On this Mother’s Day, the staff at New Mexico Voices for Children wanted to tip our hats to all of the moms out there and celebrate them for doing all they do. As a working new mom myself, I thought we might also talk about some of the unique challenges that moms who work outside the home face. Working mothers are now the primary or co-breadwinners for two-thirds of American families. Among low-income families, 39 percent are headed by mothers, according to the Working Poor Families Project. 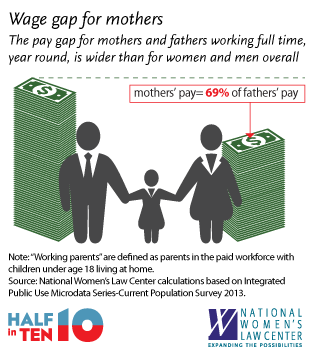 Yet, just as there is a wage gap between men and women, there is a significant wage gap between mothers and fathers: mothers earn only 69 cents for every dollar that fathers make. Nearly 20 percent of these working mothers earn minimum wage. For a lot of working mothers, problems securing high-quality and affordable child care make these income challenges worse. In New Mexico, full-time infant child care averages almost $7,400 per year, and that does not even ensure care at a licensed, high-quality center. What’s more, according to the U.S. Census Bureau, the average costs for child care for working mothers rose more than 70 percent from 1985 to 2011. Clearly, the cost of child care can be a huge financial challenge—especially for moms making low or minimum wages. Even when moms can find child care they can afford, or they are able to secure it with the help of assistance that is available to low-income families, most moms don’t have paid sick or family leave or flexible schedules that allow them to take time off to care for their kids when they (inevitably, as I have found) get sick—a task that disproportionately falls to mothers. Moms are working harder than ever before—both in and out of the home—to raise and care for great kids and to contribute to their professions and their communities. It’s time for us to work just as hard to ensure that they are supported in doing so! There are policies that would both help mothers strengthen their economic security, as well as provide stable, healthy, and stimulating environments for their kids. Tax programs like the federal Earned Income Tax Credit, New Mexico’s Working Families Tax Credit, and the Child Tax Credit can all make a big financial difference in the lives of mothers and help them provide for their families. Strong equal pay laws can shrink the earnings gaps for moms and ensure they are getting paid equally for equal work. A raise in the federal minimum wage would bolster the economic security of the 4.7 million, or one in five, working mothers nationwide. Work supports such as paid family and medical leave and access to affordable health care coverage can allow moms to take time off to care for a sick child without fear of losing their jobs. Increasing funding for child care assistance and improving quality for child care and pre-kindergarten programs can go a long way toward making sure that mothers can afford trustworthy child care and education for their kids while they work. These proven policy solutions are widely supported by the majority of Americans because they are good for families and the economy. They can help ensure that moms have adequate opportunities to help themselves, their kids, and their communities thrive. For the good of all, let’s make moms and families a priority, not just on Mother’s Day, but every day! Amber Wallin is a Research and Policy Analyst for New Mexico Voices for Children. Reach her at awallin@nmvoices.org.